New work suggests that the dark, donut-shaped clouds of gas and dust shrouding the black holes at the center of galaxies may not be the only feature responsible for the difference in the way those black holes look — in fact, different types of active galactic nuclei have different physical features. A supermassive black hole lies at the heart of most galaxies, and a new study suggests how these ravenous cosmic structures may ultimately define their hosts. Using data from the Burst Alert Telescope aboard NASA's Swift satellite, an international team of researchers found that Type I and Type II galaxies appear strikingly different, due to the rate at which their central black holes — also known as active galactic nuclei (AGN) — gobble up surrounding matter, according to a statement from the University of Maryland (UMD). "The unified model has been the prevailing wisdom for years. However, this idea does not fully explain the differences we observe in galaxies' spectral fingerprints, and many have searched for an additional parameter that fills in the gaps," Richard Mushotzky, a professor of astronomy at UMD and a co-author of the study, said in the statement. "Our new analysis of X-ray data from NASA's Swift Burst Alert Telescope suggests that Type I galaxies are much more efficient at emitting energy." The Burst Alert Telescope can detect high-energy, or "hard," X-ray emissions from a galaxy's central black hole. By comparing X-ray emissions from Type I and Type II galaxies, the researchers found that AGN in Type I galaxies consume material and emit energy much faster than they do in Type II galaxies, regardless of which way the galaxy faces Earth, according to the study. 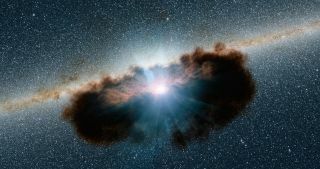 "Our results suggest this has a lot to do with the amount of dust that sits close to the central black hole," Mushotzky said in the statement. "Type II galaxies have a lot more dust close to the black hole, and this dust pushes against the gas as it enters the black hole." In addition to the data from the Swift satellite, the researchers also measured the mass and growth rate of AGN in Type I and Type II galaxies using data from 12 different ground-based telescopes, according to the statement. Previous studies have largely focused on Type II galaxies because AGN in Type I galaxies are very bright and more difficult to observe. According to the unified model, this was not a problem, because all active galaxies were believed to be fundamentally the same. However, the new study reveals a need to direct more attention toward Type I galaxies. "But now, because our results suggest that the two types of galaxies are indeed fundamentally different, it is likely that a lot of researchers will re-evaluate their data and take another look at Type I galaxies," Mushotzky said. "By putting us on a path to better understand the differences between the galaxies that host Type I and Type II active nuclei, this work will help us better understand how supermassive black holes influence the evolution of their host galaxies." Their findings will be published Sept. 28, 2017, in the journal Nature.